Prime Minister Antonis Samaras: Greece’s economic troubles will not lead to it being expelled from Europe. 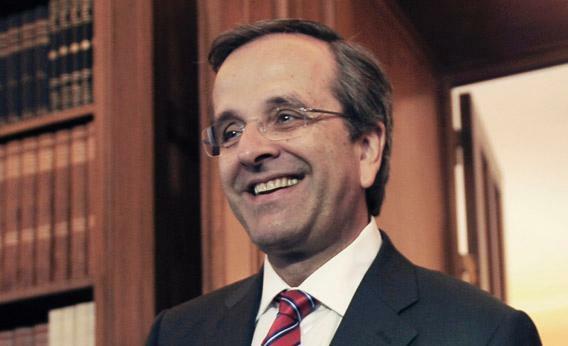 An interview with Greek Prime Minister Antonis Samaras. Photo by Louisa Gouliamaki/AFP/Getty Images. L.W: How did your meeting with European Central Bank President Mario Draghi go yesterday? A.S.: We talked about the need for liquidity. It is a prerequisite for us to start the much expected recovery. Without liquidity, you cannot give money to small, medium, or large enterprises through the banks, and you cannot allow the system to breathe. And we need a lot of breaths at this point. L.W. : Did Draghi tell you anything specific? A.S.: We proposed different things to him: The ECB provides liquidity, either through bonds or through the emergency liquidity assistance. Other countries have access to the markets, whereas Greece does not. Therefore, we have to get liquidity through the ECB. L.W. : Did Draghi give you hope? A.S.: Draghi, like everyone else, is talking about the need to first see the troika report. L.W. : Reportedly, the troika is demanding that your government is going to have to come up with spending cuts of about 11 billion euros and additional tax revenue. Do you believe you can do this and get your coalition partners to agree? Can you get it passed by parliament? A.S.: Our determination is given. It is 11.7 billion euros in expenditure cuts. All 11.7 billion has to do with making the government smaller and the whole system more efficient. Through cutting more expenditures, the economy becomes weaker because [there is] a GDP decrease. In the last five years, our GDP decreased by 20 percent. If we are to add this additional 11.7 billion, our GDP will decrease by about 25 percent. This is too big to swallow. L.W. : But you are going to go through with the reforms? A.S.: We have to make sure that we abide by what we have signed because we believe that what they call “Grexit” [a Greek exit from the eurozone] is not an option for us—it would be a catastrophe. In 2013, we are going to have a country in the sixth year of a recession with unemployment above 22 percent and rising. We are here to fulfill our obligations, to meet our targets. We only insist upon that missing ingredient, which is to bring recovery soon. How? Liquidity. L.W. : If you get the troika money all at once, wouldn’t you use it to recapitalize your banks? A.S.: Yes, if we get the next tranche, which I hope will be in October, it will recapitalize the banks and provide us with more than $6 billion of arrears, which is money the government owes the private sector. This will enhance liquidity. But the IMF has already estimated that the next three years will find Greece still in a recession. We have to avoid this by any means. We have to make sure that instruments like the ones that can be put forward by the ECB will be activated for Greece. A.S.: These are funds already earmarked for Greece that are still [frozen]. These funds and two other factors will serve as a fiscal stimulus. The first is we have to fight tax evasion. We have to reform the tax-collecting mechanism and to ensure there are harsh punishments for those who evade. The other element is privatization. … But we need to conclude this deal fast. The troika is in continuous talks with the minister of finance and other ministers. We have to get to that 11.7 billion and be sure that both agree on the numbers. L.W. : Isn’t the troika demanding that you pass the cuts through parliament? A.S.: I have to pass it through parliament, and it will pass parliament because we all realize the No. 1 prerequisite for our future is to stay in the eurozone. But it is a four-year program, not something we can do today. L.W. : But you asked for a two-year extension, didn’t you? A.S.: We are asking for enough time. Instead of the 11.7 billion euro package taking place over two years, it would be best if it were to take place over four years. Two years—up until 2014—has been accepted by the troika. We are talking about an extension to 2016. L.W. : Why would they give you an additional extension when Greece has never met a target? A.S.: I believe it is reassuring for them to see the numbers. Yesterday, we had the statistical evidence that in July and August, expenditures fell by 17.5 percent compared to this time last year. … We are taking steps that show that things have changed in Greece. We have decreased the salaries of everybody who partakes in politics, from the president to the prime minister to the MPs [members of Parliament]. We have cut expenditures that have to do with parliament. Everybody knows we are serious. L.W. : People say that you are pro-reform now, but for two years, when you were in the opposition, you were opposed to the very reforms you advocate now. Did you make a mistake? A.S.: I have always believed that this idea of having a nation go through this very painful five or six years of continuous recession with high unemployment would be detrimental for the economy and the society. … Very serious mistakes were made by previous governments, and Greece was ready to be abandoned by its partners and to leave the eurozone, which would have created total catastrophe. When this was imminent, we came in and helped change the government and asked for quick elections so that we could finish the job. L.W. : But outsiders criticize the lack of structural reforms in Greece—a lack of willingness to fire public employees, the unwillingness to open up these so-called closed trades where you prohibit competition. A.S.: Most have been opened up by laws. We voted for them. This will not be a problem in the future. Most of it has been fully liberalized. L.W. : Are you concerned about potential social disorder due to the enormous difficulties the Greek people are having to endure? A.S.: There are going to be a lot of problems with social cohesion. We are already cutting down everything to the bone. Unless there is light at the end of the tunnel, then yes, I am very concerned. So we have to get light at the end of the tunnel. That’s my primary policy. And hope cannot be there unless we get the next tranche quickly so we can have recovery. We are a pivotal part of the European Union. Any destabilization of Greece would totally rock the boat. I wake up every morning and say, “Has anything happened to Syria today?” If something happens in Syria, thousands of people would be flowing into Greece. Illegal immigrants are already a very big problem for us. We are already taking big steps to disallow illegal immigrants from coming in. Imagine if that number is multiplied by 10. L.W. : Many U.S. businessmen believe that Greece will exit or be exited from the eurozone. Are they wrong? A.S.: They are absolutely wrong. L.W. : Are you getting good signals from the Europeans? From German Chancellor Angela Merkel, for example? A.S.: If you look at the signals a month ago and then look at them recently, they are very different. A.S.: They saw what we are doing and that we are determined. L.W. : Given the depth of your financial difficulties, it is hard to understand why no government has touched the public sector. A.S.: That is by the constitution. L.W. : Doesn’t it make it very difficult to run a government when you inherit a large, untouchable public sector, much of which is uninterested in pursuing reform? A.S.: During the socialist period, the government became too big. That created a crowding-out effect in the private economy, and it gave everybody the need to pay more taxes in order to finance this big government. We are against big government. We want a smaller and more efficient government. L.W. : But your GDP has shrunk 20 percent in the past five years. Isn’t it slated to go down another 7 percent this year? How do you break this cycle? A.S.: You start increasing the GDP through liquidity methods, through structural funds, through privatization, and through investments. A.S.: It is very important. There are many people abroad who want to help, who want to invest. In the past, they used to come here, and they found a negative environment. Today, instead of red tape, we will give them the red-carpet treatment. We want them to realize that this is a land of opportunity. It always has been so, but we never allowed foreign investment to come into this country. … We made it so difficult for them. They got sick and tired of it. L.W. : Was that partly to protect Greece’s own businessmen? A.S.: It was a culture that business is something bad—it was a leftist-oriented psychology. We have to break this. We are pro-business. We want entrepreneurs to come to Greece, see the opportunities, and invest. We have to capitalize on tourism and the maritime industry. The previous governments abolished the Ministry of Tourism and the Ministry of Maritime Affairs. It is as if Saudi Arabia abolished the Ministry of Oil. L.W. : Do you think the Greek people will rally behind you? A.S.: I think that people are ready to take that leap forward with us, yes. L.W. : Are you ready to do it even if it is not politically popular—even if you get defeated? A.S.: Absolutely. It’s not me. It’s not my party. It’s not my friends. It’s my country, and I don’t play with my country. I won’t do that. L.W. : Are you saying you can’t just have austerity alone? L.W. : Does the troika understand that? A.S.: I think the troika and everybody else understands it after seeing that Greece has been in recession for six consecutive years. L.W. : Do you think they are willing to go easier on your country? We have to make sure we do not leave the eurozone and that we are safely within Europe. Many leaders abroad today realize this is the best not only for Greece but also for Europe. The consequences are unknown as to what would happen in Europe were Greece to leave. What would be the reaction of the markets? They would hit the next nation. L.W. : They would hit Spain? A.S.: They’d hit some country for sure. Nobody knows the consequences. But I cannot rest assured that since the others know this, maybe they will not kick us out. I have to make sure this does not happen. You don’t play with death, and this would be deadly for Greece.